So, I thought I’d answer two questions in this blog post. The first was a question from an article in Östersundsposten this week, asking who you think is the best player ever to have played in ÖFK. The second was a question I got when I wrote about Lasse Vibe and his efficiency in terms of his ratio between expected goals and actual goals. Now, the answer to the two questions turned out to be related and make one blog post. 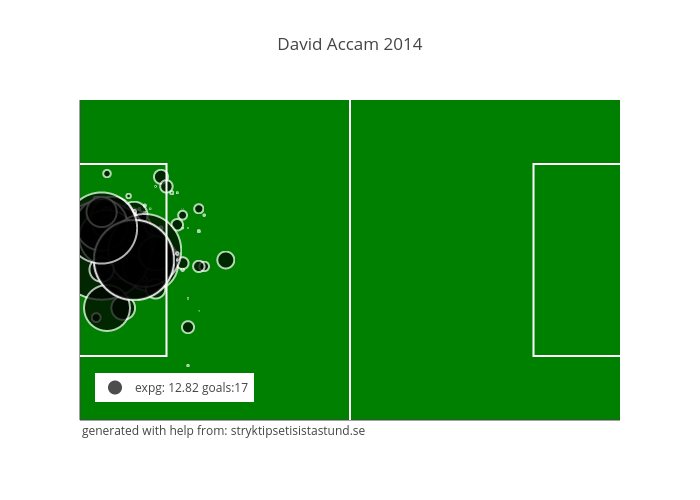 For me there is no doubt that David Accam is the best player to ever have played in ÖFK. He had speed, finishing quality, strength and technique that by far was the best in the league when he played for ÖFK. He was much more superior than Modou Barrow was. A while back I got a question in this tweet and today I looked in to it. I checked the G/ExpG for all the top scorers in Allsvenskan the last season and this. Guess who had one of the the best ratios in 2014? Correct: David Accam. Accam was outstanding in Helsingborg, in my opinion perhaps the best player in Allsvenskan in 2014 (sorry Markus Rosenberg). Some time when I get time I’ll add expg/90mins to make the figures more accurate but one can see that Lasse Vibes figures really not are outstanding but rather just average for a top scorer in Allsvenskan especially if you sum up 2014 and 2015. Instead I would like to take my hat off for Henok Goitom who is a true quality player!